Forced romance is not my cup of tea, but Valentine’s Day is a great excuse to herd the kids into the kitchen for a bit of themed cooking! I’ve developed a few recipes with this in mind for Parentdish.co.uk and thought they might inspire you. These are mega mega easy but oh-so-pretty. 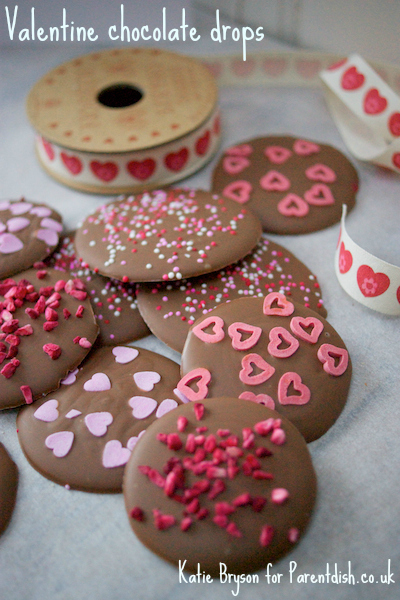 All you need is some good quality cooking chocolate and a variety of valentine-inspired sprinkles. My absolute favourite were the morsels of freeze dried raspberries that you can get in the baking aisle at Sainsbury’s. They look and taste really classy. Parcel your drops up in pretty gift boxes and your kids can give them to their friends and relatives as a fun treat. 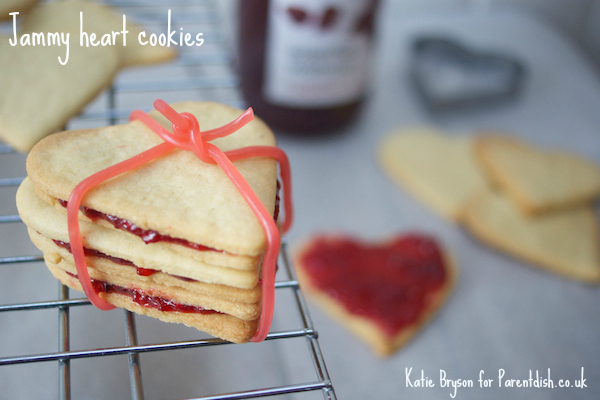 These heart-shaped bakes are made with the help of some marbles popped into the muffin tin! It’s a nifty trick I found when scouring Pinterest for inspiration. 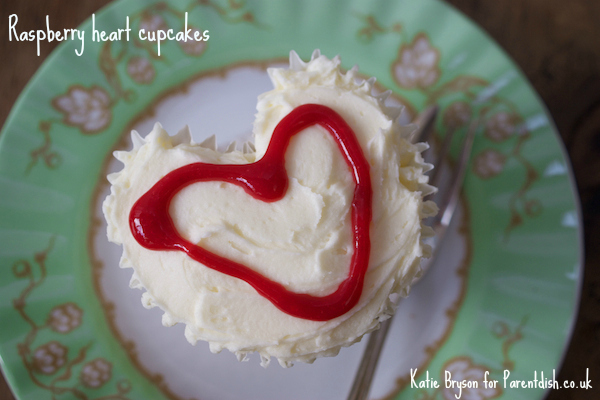 The cakes themselves have a hidden raspberry nestled in the middle of the sponge which is topped with vanilla frosting and a heart drawn with home-made raspberry sauce. Utterly delicious and highly scoffable. Fridge cakes are my new obsession as they require no baking, just a spot of chocolate melting, chopping, mixing and chilling. They’re ideal for the school cake stall or popping into a pretty tin to give as a gift. This fun version has love heart sweets on the top, but you could customise yours however you please. We have a £2 budget for Valentine’s this year and I’m so tempted to make the Valentine fridge cake. Oh these are so pretty. I have just held a Valentine themed bake club. 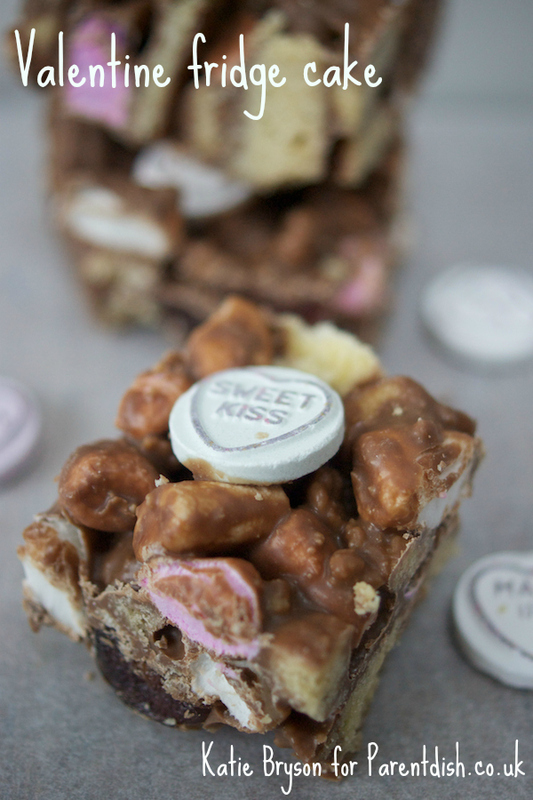 Now I wish I had made that rocky road fridge cake too. I think I shall be doing some Valentine baking with the kids next weekend and there is a Valentine cake sale at school too, cupcakes or fridge cake?! Nice ideas Katie, I need to start working on my Valentine posts. I love the chocolate drops idea. Simple but very appealing.